San Giorgio island is one of the most photographed subjects in Venice. 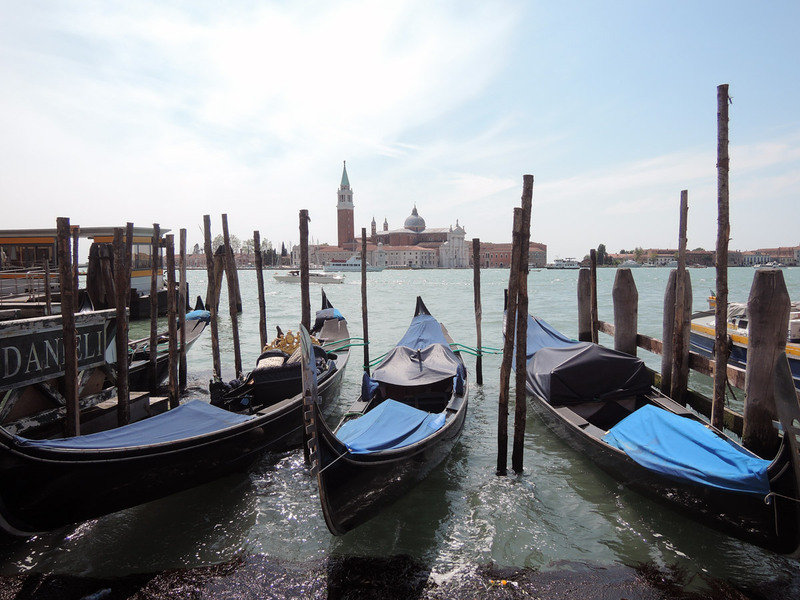 Do you know that classical yet amazing picture of gondolas with a little island and a white church on the background ? That’s it! But have you ever been on the other side? For those who have not, you must know that on the little island of San Giorgio Maggiore in Venice you can enjoy a breathtaking panorama without queue and without many efforts (there’s a lift). Due to its position just in front of St. Mark’s square, San Giorgio island, also called green island or cypresses island, has always been a strategic point to control goods traffic between the lagoon and the islands and a venue for illustrious guests. After the fall of the Serenissima, it became a free port. I arrived at the Santa Lucia station and immediately embarked on the number 2 vaporetto direction San Zaccaria. The sailing lasted about 45 minutes. The first part was the last interesting, but then the route runs along the Giudecca island (on the right) with the Molino Stuky building, the Zattere in front of it, and then again the Redentore Church ’til you spot the white San Giorgio facade and, on the other side of the Basin, Palazzo Ducale and San Marco. While arriving from the train station it can be quite a journey, if you leave from San Marco you’ll get to San Giorgio in five minutes. So I suggest you to look at the end of the post, where you will find the indications to take the right vaporetto! After the disembark, I entered the church and followed the arrows pointing to the Campanile (bell tower). Since there was no line at all, I decided to go up first. I paid €6 and I took the elevator (to reach the elevator there are 6 steps. Before the steps on the right there’s a door with no sign. That’s the bathroom. That day there was no toilet paper so better you take a kleenex with you). And now, I must say something. When I visit a place I’m always super nice to box office workers. First of all because I’m a nice person, second because I think it must be a bit boring, third because I guess sometimes they have to deal with rude people, fourth because I tend to ask them some extra info to write better posts. This time I smiled, I said something funny, I re-smiled… nothing. The guy was very curt. I asked him where the bathroom was and he: “There”, without pointing the direction. OK, thank you. I found it all the same. Then I asked him some info about a painting by Carpaccio, one of the masterpieces of the church. I had not noticed it so far, but it was described on my guide book. He barely looked at me murmuring: “It cannot be seen cause it’s in the monks building”. Thanks again for your kindness, dude. I had already understood that. Maybe I just wanted to know if they were visible with a guided tour, at what time, cause all I wanted was taking some info for my readers. But he spoke so rudely and irritated that I gave up and went away. Guys, I hope you won’t meet him! The view from the campanile is unique. If you’re lucky to come here in a clear day you can perfectly see the mountains on the background, beyond San Marco. Furthermore, the view over Santa Maria della Salute is wonderful. The campanile area is very windy though. I then visited the church. 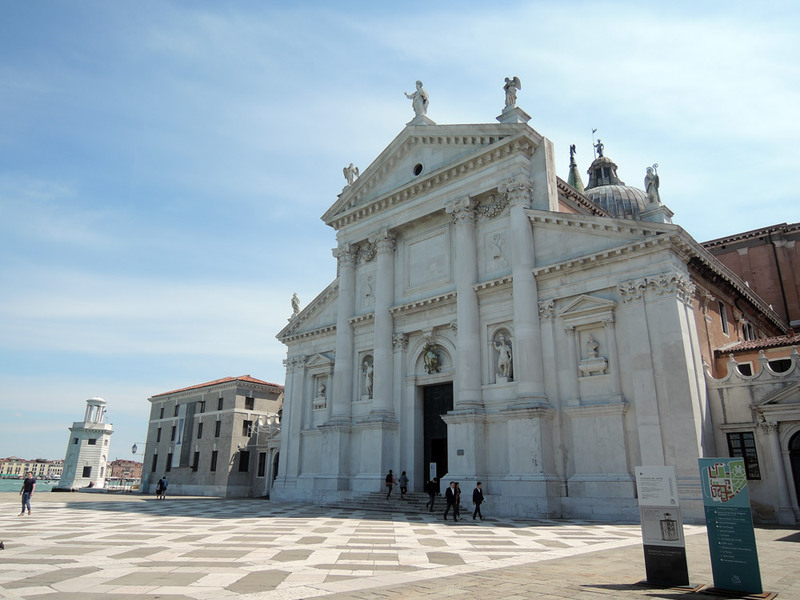 The project was by Palladio and the construction began in 1566. The façade is a mixture between a Christian sanctuary and a classic pagan temple. The interior is very bright. Quite bare, I dare say, if compared to other Venetian churches, which are very baroque and covered with sumptuous decorations. One of the things I liked the most was the wooden choir stalls. Each year on December 26th the Doge used to attend here a Mass sung by a double choir: the choir of San Marco and the choir of the monastery. The two big canvas on the sides are by Tintoretto: on the left The fall of Manna, on the right The Last Supper. A door on the right leads to the hall where the “not visible” painting is displayed: San Giorgio and the dragon by Carpaccio. I’m very disappointed. I would have seen it galdly. Other paintings: Entombent of Christ by Tintoretto, Virgin and Child with Saints by Ricci, Adoration of the Shepherds by Bassano, Risen Christ and St. Andrew with the Morosini Family by Jacopo and Domenico Tintoretto. Surely you’ll notice the giant hanging hand. That is an artwork entitled “Together” by the Spanish artist Jaume Plensa. 8 different alphabet characters form it (Arabic, Aramaic Chinese, Cyrillic, Greek, Hindi, Japanese, Latin). It will remain in San Giorgio throughout the 2016 Jubilee as a symbol of Mercy. The passage of a gigantic cruise ship. Oh my God! It seemed the Star Destroyer approaching. Like at the beginning of the “Star Wars” film, when this ship goes on and on and seems endless. It was so big you can’t imagine. And so close… too damn close. A wrong manoeuvre and the entire San Giorgio island would have been wiped out completely. I know that these ships bring tourists, vital for Venice. But if you’d have seen that monster so close like I did, you would agree with me: it is a terrible and dangerous thing! See for yourselves! And please subscribe to my YouTube Channel by clicking the red button on the left. Grazie mille! On the island you can also see a sailing club or visit the Cini Foundation, but only on weekends and with a guided tour. Therefore it’s better to check first cause it often hosts meetings and events (and in this case it is close to the public). In conclusion I must say I loved this experience (not the rude dude) and I would suggest it to you. Then let me know if you liked it as mush as I did!